After the enthralling success of the Indian men?s boxing team at the 2011 AIBA Boxing Championship, boxing aficionados will be treated to some power packed performances at the national arena as the women boxers of the country stake a claim for the most prestigious title in the domestic circuit. The state of Madhya Pradesh is all set to host the 12th Senior Women?s National Boxing Championship. T.T. Nagar Stadium in Bhopal will witness cream of boxing talent with 250 women pugilists from various state/board teams all geared up to put their best foot forward in hopes of being crowned national champions. The battle for national pride will have 40 medals at stake spread over ten weight categories. The National Championships, often considered as the melting pot of talent, provides a platform for current champions to reassert their dominance in the sport and for emerging boxers to display their skills and excel at the national arena. The event is being organised by the Madhya Pradesh State Boxing Association under the aegis of Indian Boxing Federation. Secretary General of Indian Boxing Federation, Brig PK Muralidharan Raja believes national championships play a significant role in the development of an athlete and offer the most sought after title at the national level. He said, ?The national title holds a special place in every boxer?s career, this is one award every athlete desires.? Talking about women?s boxing he further added, ?There has been a big surge in the popularity of the women?s boxing in India and world over after the discipline was included in the Olympic program. With name like MC Mary Kom, L Sarita Devi, Kavita Goyat and a talented young crop of boxers coming to the fore in the country, the sport has a bright future ahead.? The 12th edition of the championships also assumes added importance with the 2012 AIBA Women?s World Championship and the London Olympics fast approaching, and the fact that World Championships will be the only qualifying tournament for Women's boxing at the Olympics. The event will serve as a selection ground to shortlist players constituting the final core group for the World Championships and the London Olympics camp beginning 23rd October in NIS Patiala. ?The National Championships is where talent is spotted and nurtured; therefore it makes for an ideal ground for emerging boxers. It is also an opportunity for the boxers to represent their state and board, and give something back to their home teams.? states national coach Anoop Kumar. Talking about the selection of the core group for the WC and the Olympics he said, ?We are already aware of the pool of talent that is available, but the finals selections will be made based on the performance of the boxers at the championship?. The prestigious tournament will have many star pugilists vying for glory but one contest that everyone would looking forward would be between current and five time Women?s World Champion MC Mary Kom and former World Champion L Sarita Devi in the fly weight division. Mary jumped to 51 kilogram weight class, owing to her preparations for the Olympics (only three weight categories are included in the programme for the London Games ? 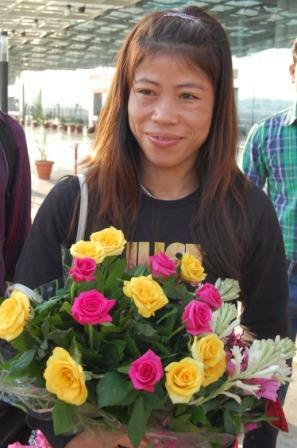 51kg, 60kg and 75kg) and has come in direct competition with her Manipur mate and reigning national champion Sarita Devi. The boxing legend is quite keen on bagging the national title this time around and prove a point to her rivals. Sarita Devi, who would be representing all India Police, also has her eyes set on victory and would try her level best to defend her title. The seasoned boxer looks forward to locking horns with Mary Kom in the event and, ?I wish to take on Mary at the National championships and prove my mettle against her?.